"Medium size, very nice outline, balanced front and rear, good strong movement with very little motion to his back, clean coming and going. Good head, dark eye, and good earset. Needs just a little more development and could use a little more desire." ".. a balanced, masculine male with a masculine head and dark eye. Clean coming and going with excellent pigment. Not as extreme as my first two males and seemed to be letting down a little." 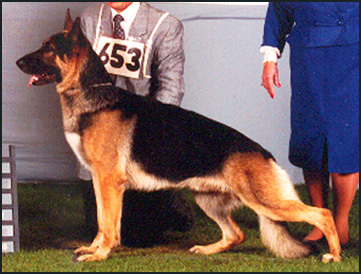 "This dark, black and tan is a very complete, sound German Shepherd Dog. He has a pleasing and correct outline when posed. He is masculine, strong, shows good pigmentation, and is hard and athletic. Although not flashy in motion, he is correct. He is a steady mover and did not vary from beginning to end. He has a good front and shows nice extension (while keeping his feet close to the ground). He offers a firm back, a level topline, and a smooth, fluid hindquarter that follows through effectively. He has good ribbing, straight legs, and good feet. He is clean coming and going and is confident when approached. In motion, he retains his outline very uniformly on a loose lead. His only drawback, in my opinion, may be that he doesn't run fast enough for those who think that showing German Shepherd Dogs is a road race."